Udaipur: 350 Resident Doctors associated with RNT Medical College called it a strike on Sunday at the medical college and hospital premises, demanding the withdrawal of FIR lodged by one traffic ASI against two of their colleagues. The two resident doctors, identified as Dr Deeparam and Dr Singh, have been accused of misbehaving as well as assaulting the traffic ASI Mishrilal while he was on duty. According to the Hathipole SHO, Ravindar Singh Charan, the traffic ASI was beaten and humiliated when he caught the doctors for speeding on the routine check at the hospital entrance gate. However, the two doctors allegedly began abusing and bashing up the cop. The police while registering the FIR on the basis of the complaint of the traffic cop have begun their investigation into the matter and have now sought the CCTV video footage of the incident. Fearing arrest of the Doctors concerned, the RDA at the medical college chose to protest by going on strike demanding the withdrawal of the FIR. 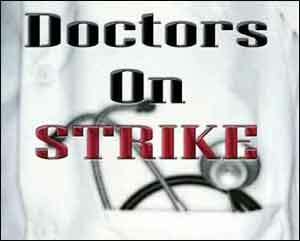 They later on decided to approach the doctors in the entire state to come forward for the strike. Doctors claim that the police are being biased, and are angled towards taking actions against the doctors.